School children spend a third of the week growing food, looking after land and animals and learning to cook. Neighbors take down fences and, pooling resources, grow copious vegetables on the connected plots. Inner-city estates install raised beds on flat roofs and in car parks and charge them up with community compost. Lonely elderly people open their gardens to teams of neighborhood growers who visit regularly to maximise output and share out the healthy produce. These are just some of the new approaches to food production being experimented with today and not only do they offer affordable, healthy nutrition without the ecological impact of industrial farming they boost: community, quality of life and health. On top of that, by taking the pressure off agricultural land they offer the opportunity to rewild degraded farmland - boosting planetary health, enriching our lives and protecting us from environmental change. Far more people in developed nations could be involved with growing food and with skilful, labour-intensive farming we can produce plentiful produce closer to where we live. Setting a course in this direction offers solutions to many intractable economic, social and ecological challenges but it requires thinking differently about how we live and what the thrust of our economies should be. It might be surprising just how much could change by looking at farming and our relationship with food differently. The thrust of industrialisation has been to increase the efficiency of labour via mechanisation. In farming, this means that fields and machines have become bigger and the agricultural labour force has shrunk. Large fields worked by tractors offer little employment opportunities, nor habitat for wildlife, resulting in a countryside that would seem barren to our great grandparents. 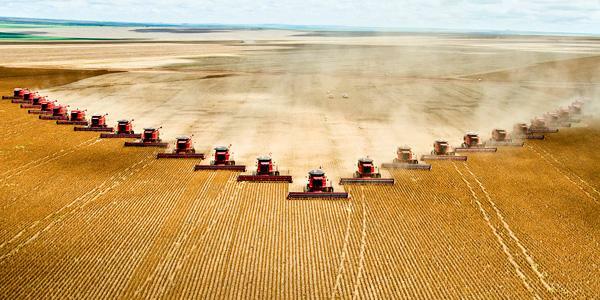 The companies selling agricultural machinery, and the genetically modified seed that goes with it, tell us that as the human population increases so must the proportion of the planet given over to agricultural land and also the intensity of fossil-fuel-based inputs (for example patented fertiliser and pesticide). This increasingly sounds alarm bells for ecologists monitoring the current collapse of wild species (also known as The Sixth Mass Extinction Event). If we convert more wild land to farm land - where will other species of plants and animals live? Healthy ecosystems are the foundation of civilisation and our last and best defence to a changing world. Hence, rewilding is trending - seeking to upgrade degraded countryside into thriving, exuberant habitat. Reintroducing diverse species we protect watersheds, absorb carbon, save bees and benefit from a beautiful countryside rich with new recreational, economic and aesthetic opportunities. 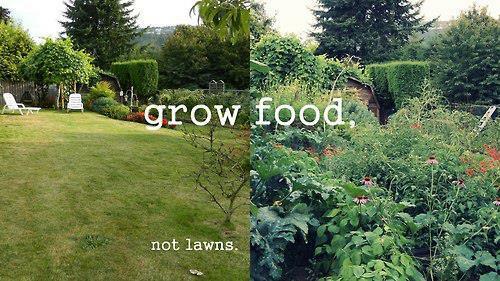 Sounds great - but for this to go large we need new ways of growing food. Already, examples of local self sufficiency abound. 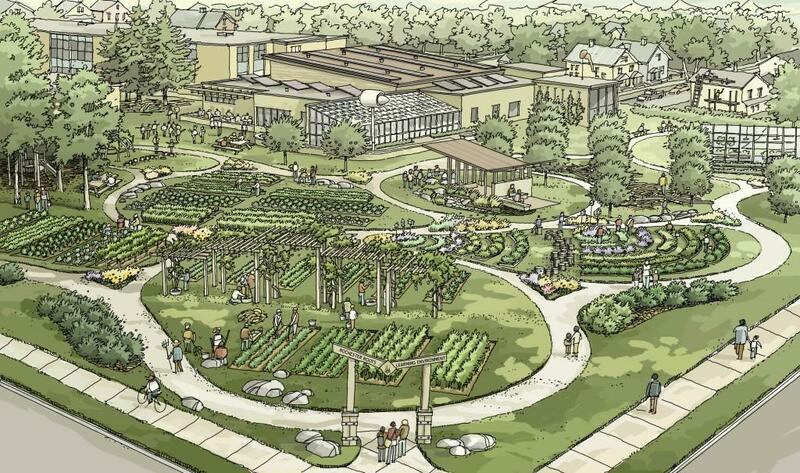 In Detroit, when the big car companies collapsed urban farms grew up in their rubble. 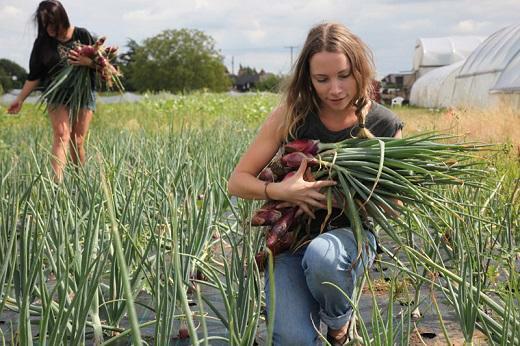 In Hackney, hipsters and pensioners rub shoulders at the city farm. 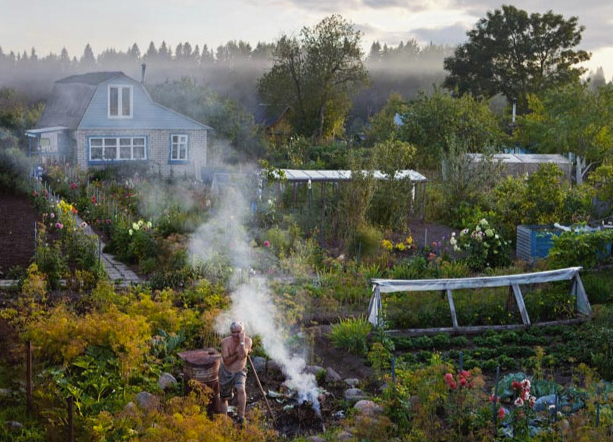 Across England allotments have multi-year waiting lists and up and down the country most gardens are based around a prominent, monoculture lawn - which is mowed using petrol and offers almost no ecological value at all. We are surrounded by space to grow and people eager to do the growing. For legions of people undervalued by the mainstream economy alternative farming methods offers livelihood, fulfilment, community and, of course, fresh vegetables. There are historical examples of resurgent, hands-on agriculture. In the Second World War citizens of England were urged to “Dig For Victory”. 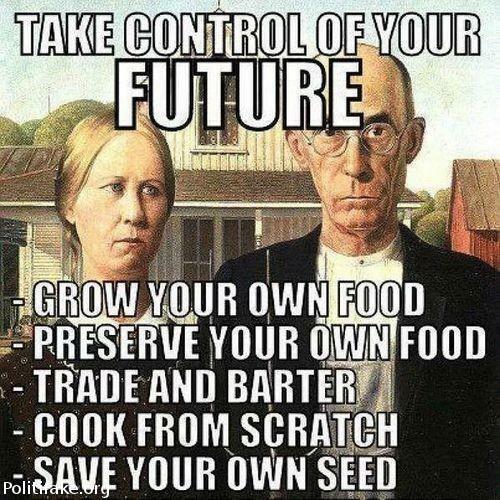 To become self-sufficient and resilient - lawns, parks and playing fields were turned into market gardens. Today, we also have: roofs, disused industrial estates, patios, terraces and balconies. Permaculture, squarefoot gardening, analogue farming, aquaponics, underground farming and other horticultural specialties have all demonstrated how productive small areas can be when tended with skill and charged with locally-produced compost. Greening cities makes them better adapted to climate change. The concrete of roads and carparks absorb solar radiation (getting hot) but not water (contributing to flooding) and fulfills no ecological function. 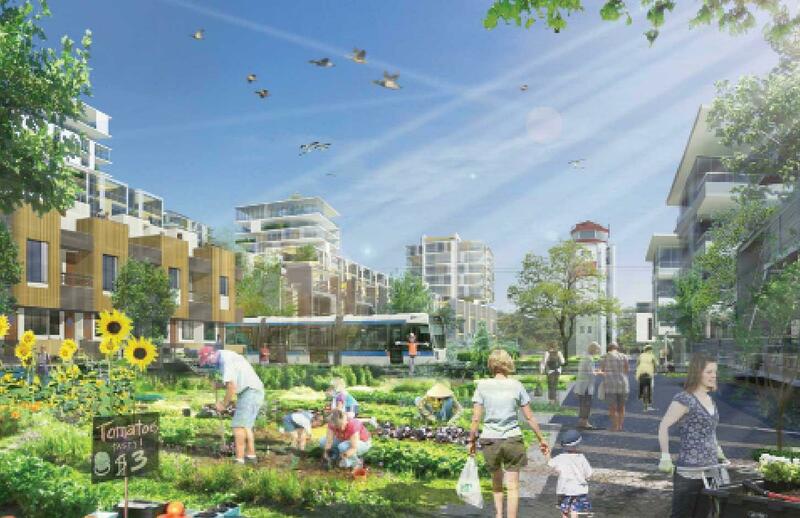 Turning just 30% of urban road space into city farms transforms the environments of cities: reducing the heat-island effect; cleaning the air and providing: shade, beauty, recreational opportunities and jobs and healthy nourishment with zero food miles. We are poised at an agricultural tipping point. Far more of us could be involved in growing food and in doing so live healthier and happier lives. However, this currently pushes against the economic and cultural norms of our times. It evokes a future in which more of us spend time outside and in our communities, digging weeds and turning compost and less time bound to the yoke of the corporate economy. The implications of increased, widespread self-sufficiency are radical. We would not be beholden to corporations to live and as such would have far greater control of our time. in doing so the stress of high consumption lifestyles could give way to something more fulfilling. Working less we could spend more time being creative and enjoying the company of friends and families in neighborhoods that are transformed to be ecologically productive. Casting forward, we can imagine how such a shift creates wider change. The land outside of cities could be transformed. Large monoculture fields could give way to highly-labour-intensive, highly-diverse, market gardens tended by communities of people who have opted out of office life. Further off, in the rewilded lands, herds of magnificent beasts would gallop free.